1. 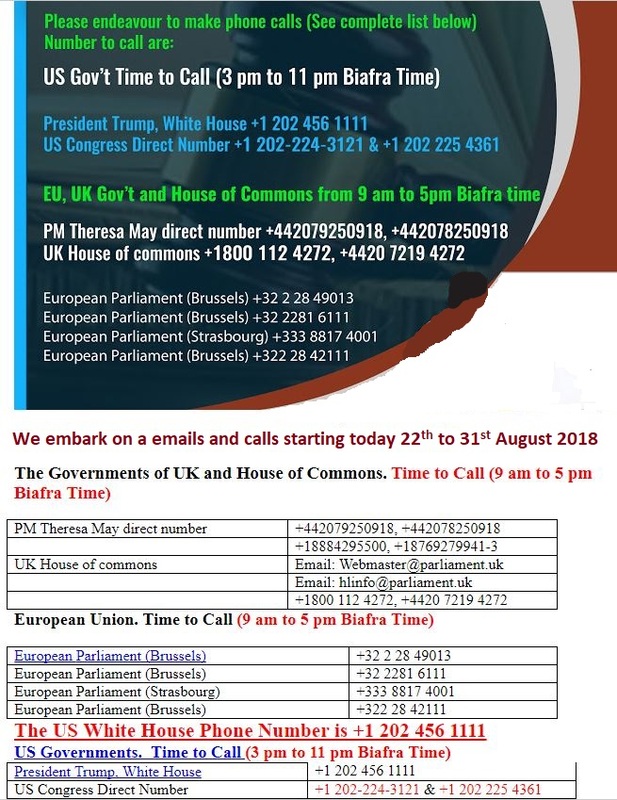 We urge you to persuade Imo state commissioner of police, ASP Dasuki Galandanchi to release our mothers and grandmothers who were arrested on Friday, August 17, 2018 while on peaceful protest demanding the whereabouts of the leader of the Indigenous People of Biafra, Nnamdi Kanu, whom whereabouts remained unknown since September 14, 2017 after the Nigeria army invaded his home. Our women were arrested, still detained under inhuman condition, for staging peaceful protests to demand for Nnamdi Kanu’s whereabouts. 2. Please stop Nigeria Army led by Tukur Yusuf Buratai from bringing Operation Python Dance 3 to South East states as the action could result unrest in the relatively peaceful region. We are still mourning our loved ones whose lives were cut short by the murderous Nigeria army during Operation python dance 2. 3. We urge you to stop selling weapons and ammunitions to Nigeria Government as they use it in killing innocent unarmed civilians, especially Biafrans because they are generally seen as enemies of Nigeria. They are defenseless and subject to incessant massacres without recourse to justice. The international community has a moral obligation to stop the endless killings of Biafrans in Nigeria.